Hey Everyone! I hope you all had a great weekend. 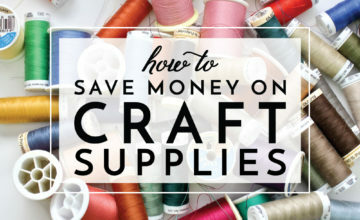 As I mentioned on Thursday, I’ve been really into my sewing lately, so I spent most of the weekend at my cutting counter and sewing machine. I have some fun things to show you coming up! 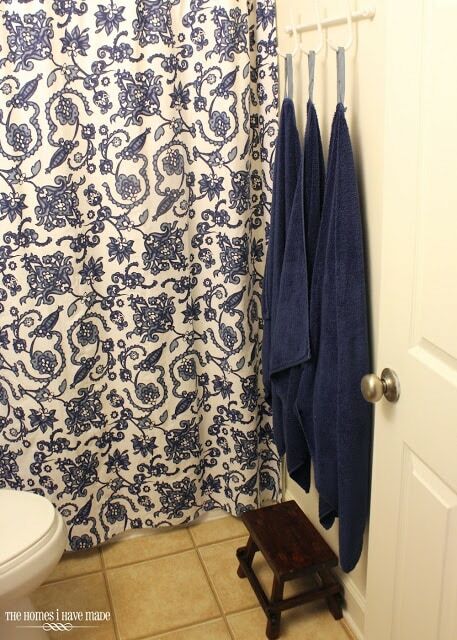 But first, as promised, I wanted to show you our “finished” hallway/guest/kids bathroom! I can be a little funny when it comes to decorating and wrapping up certain spaces. Some rooms, I can pull apart, make over, put back together, and check off the list in a matter of days. The Laundry Room was like that. And the Linen Closet. I had a vision, I made it happen, and once it was done, I was done and I moved on. Other rooms in our house though, for one reason or another, take me more time to get just right. The Living Room has been like that, our Master Bedroom, and this little bathroom. The main culprit for me is styling. Styling shelves and finding and arranging just the right items for a space is really, really, really hard for me. After months of tweaking these two little shelves, I felt like I finally got it right. And that was enough for me to pull together some of the final elements in this space to finish it off! This is one of our two bathrooms – the other bathroom is the “Master en Suite” bathroom (which I haven’t shown you yet either for pretty much the same reason: styling!). This little bathroom functions as our kids bathroom as well as our guest bathroom, as it’s right smack in the middle of the house. Since it serves two masters (so to speak), I didn’t want this bathroom to be too grown up or too kiddy. 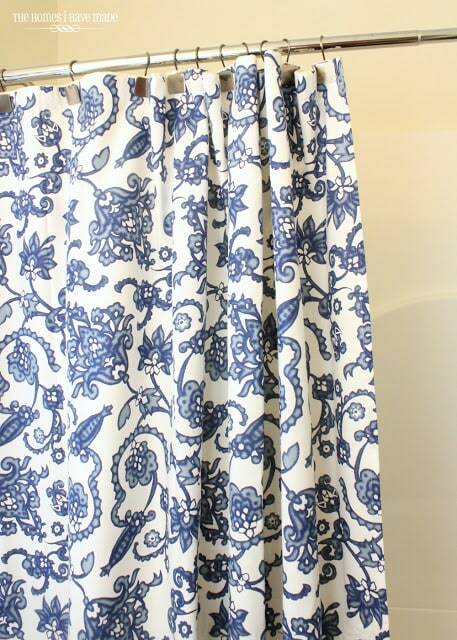 This blue and white shower curtain (from Target) was my jumping off point. We hung two floating shelves above the toilet (pretty sure these are the Allen and Roth ones from Lowes) to add some display and storage space. Again, figuring out what to put on these shelves was really tricky for me. I wanted it to have the right balance of usefulness without being too styled or cluttered. 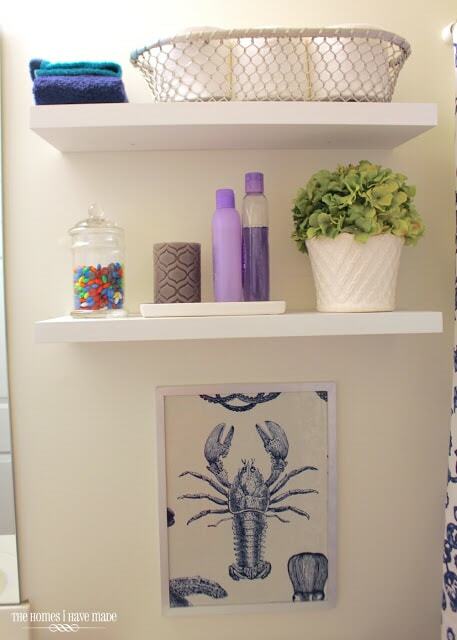 The lobster art is my favorite thing in the entire bathroom. 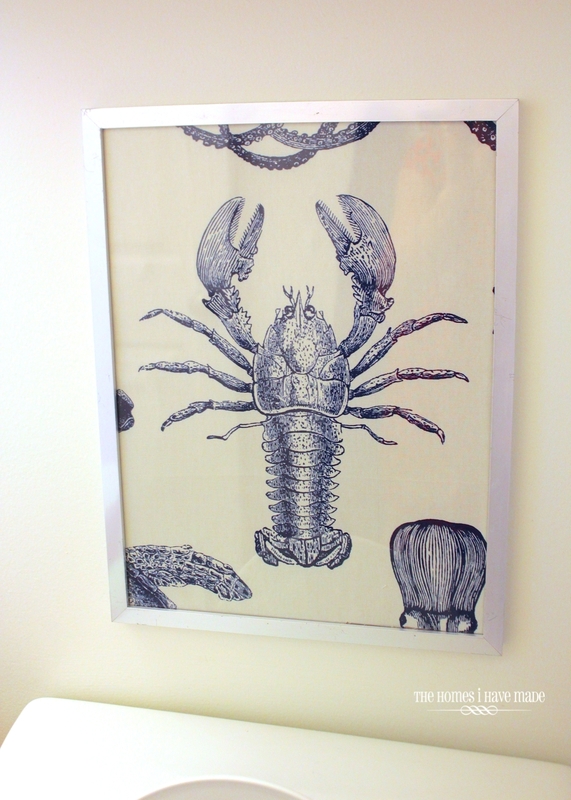 It’s actually a swatch of fabric (cut from a larger print of lots of different sea creatures) placed into a silver frame I had out in the garage. I bought this fabric specifically to make artwork out of, but chickened out thinking it might clutter up the bathroom. I decided to just do one creature (instead of a gallery of them), picking my favorite. 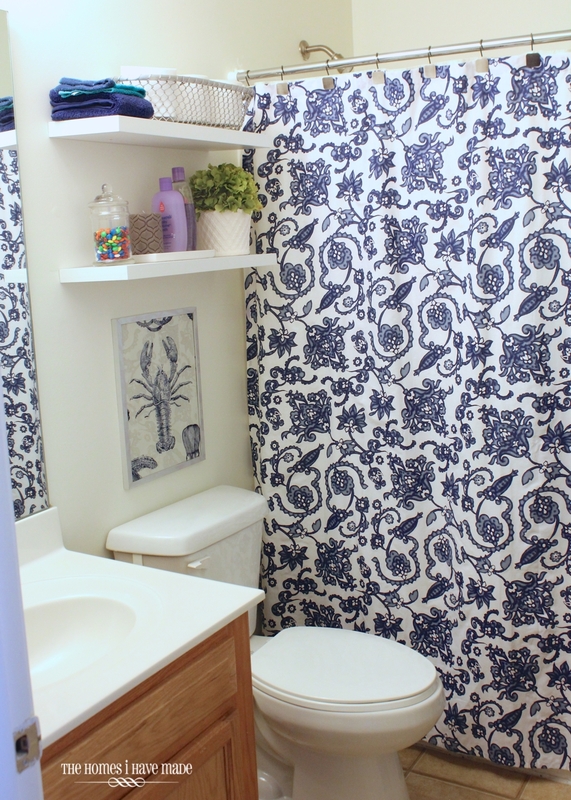 So glad I did it – it totally completed the bathroom! Opposite the toilet and vanity, we replaced the standard towel bar for a three-hook unit (also from Target). 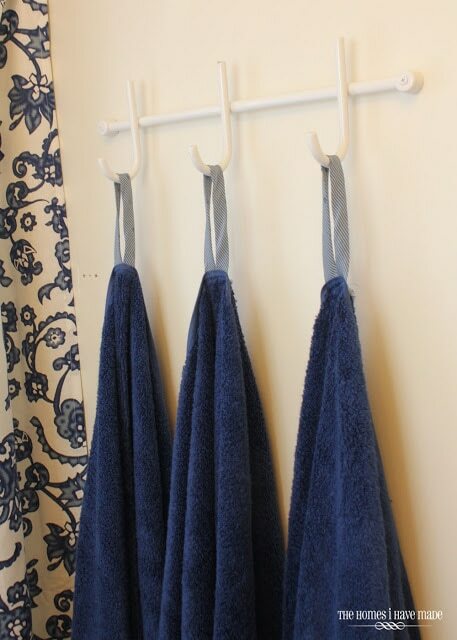 The indigo blue towels (also from Target) were given little fabric loops for quick and easy hanging! 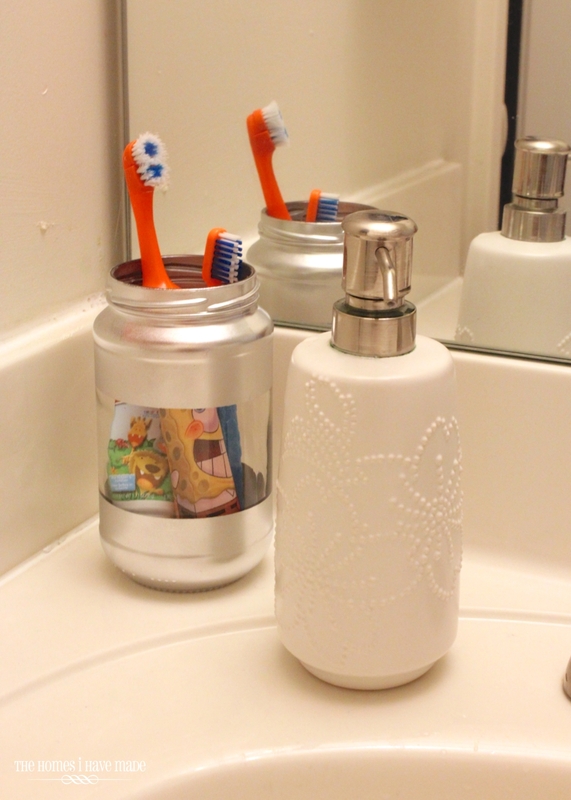 The vanity is small, so we’ve opted for only a few necessities to keep it clutter free. The simple white soap dispenser is from from…you guessed it, Target. I spray painted a cleaned-out spaghetti jar with silver spray paint to hold toothbrushes and toothpaste! 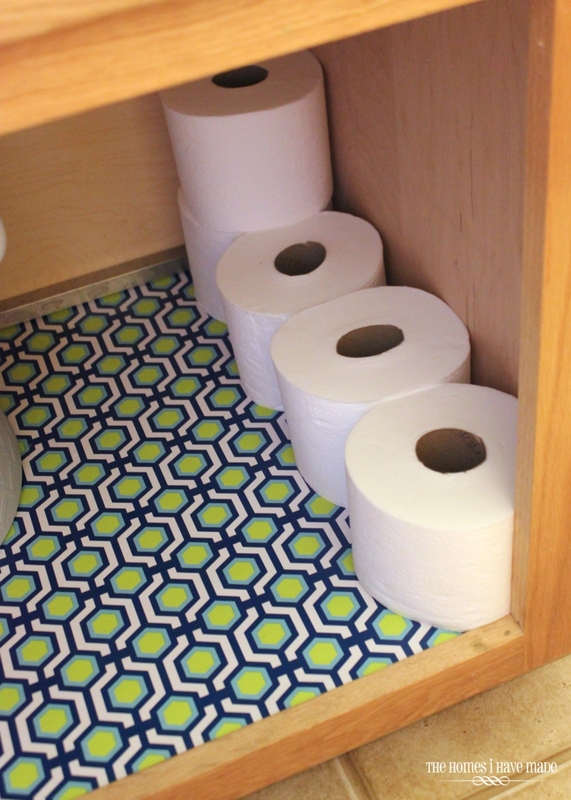 Because of our really hard working Linen Closet, we don’t have much to store under the sink in here, but it’s a perfect spot to hold all of our extra TP. 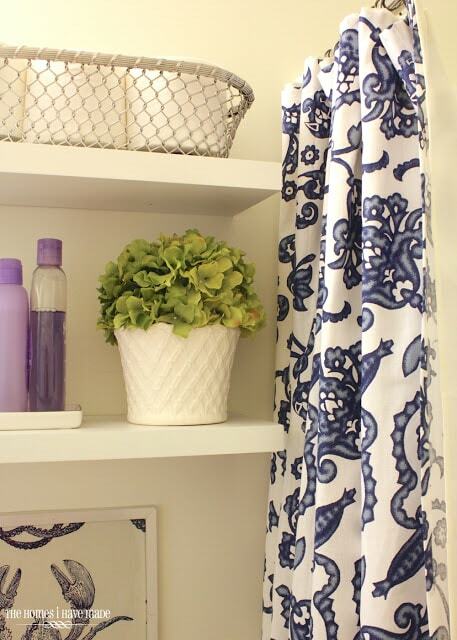 I couldn’t resist throwing down some coordinating shelf liner (leftover from the Laundry Room makeover!) 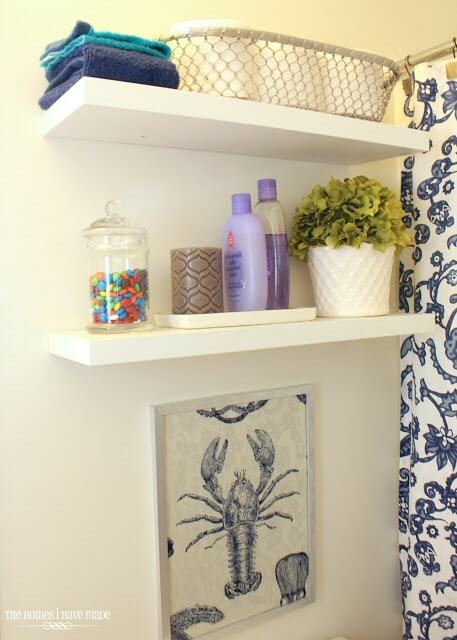 for a pop of fun when you open the cabinet! 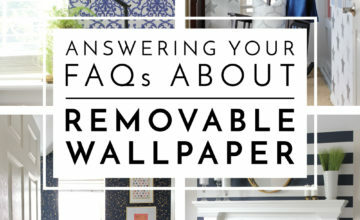 If you happened to pop over to MommyPages last week to see my interview on how I decorate while constantly re-locating, you know that one of my biggest hurdles is filling basic builder-grade homes with style. I’d give anything to paint the oak cabinet and replace both the ugly floor and mirror in here… but alas, that’s not in the cards for us in this house. 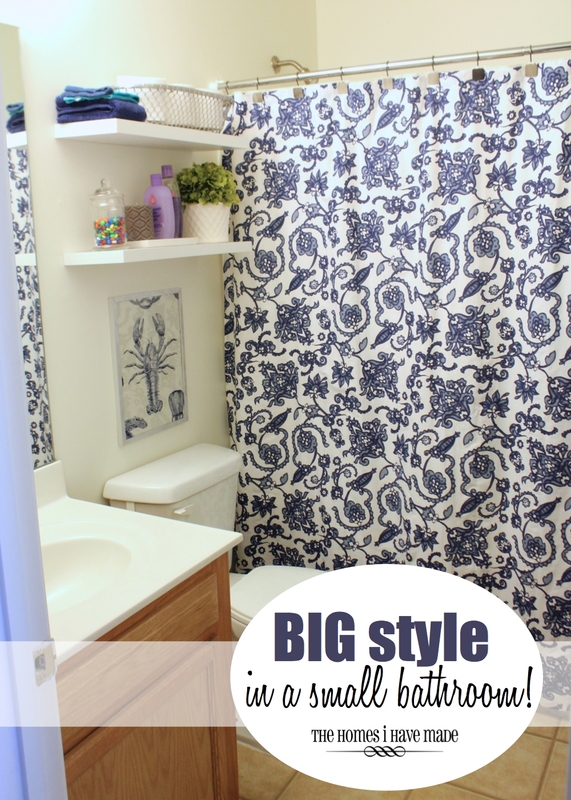 Nonetheless, I’ve been able to give this teeny tiny bathroom some big style using simple, off-the-shelf items in creative ways! Phew! LOVE knocking out rooms like this one. I feel like it sat half done for months and months, and now I love it every time I go in (which is a lot with a potty trainer!). Nothing in here is all that fancy or time-consuming….just sometimes it takes some extra time to get the little things right! Later this week, I’ll show you what I’ve been up to at my sewing machine!